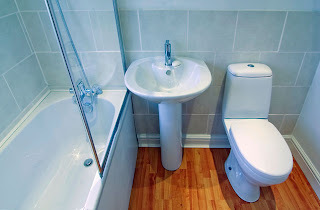 The two critical elements are the commode and the sink. They are next to or at least near each other. One does his business and quickly disposes of the evidence by washing his hands clean. Basically, in Russia, the commode is really in a commode and the water closet (WC) is really a in a closet. There is no sink or basin in the same space. One does his business, opens the door, closes that door (if he is polite), opens another door, then closes the second door, and then washes his hand. Then, with his clean hands he opens the now dirty door. So, evil forces, being cunning and sneaky, manager to track their way over to dirty the forces of good. I have not figured out the reason for this separation of powers; can someone more knowledgeable help? People in the know tell me that it is about the flow. This bathroom design was to address a population density problem inside apartments. Soviet-era apartments were rather small; maximizing livable space meant fewest possible common facilities. Because many people would live in the same small space, the commode was separated from the basin to alleviate resource scheduling issues. With this design, these two shared facilities may be engaged simultaneously (multithreading), thereby giving better "flow." Of all my posts, this one has drawn the biggest protests from Russian readers. 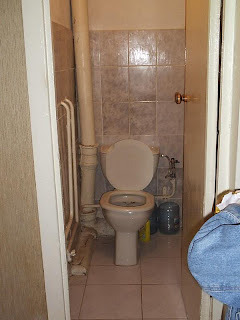 "Russian toilets don't look that ugly! Come on, get a better picture" summarizes the complaints. To reiterate the point of this blog, it is about "separation of powers" and not about "the Beauty and the Beast." I would think that a proper bathtub could serve all functions -- not unlike any college bar bathroom. What is the matter with all of these design people? Sounds like it could really inform software design by letting discrete peices be used separately and simultaniously rather than overly complicating a single workflow. Amir, you are too funny. I need to read your blogs more, I need more laughs. That is interesting that you are using less resources/groceries there as opposed to here. I think that we do overuse here simply because we can. That is why I'm really worried about this new healthcare bill...ugh. Demand is going to go up and underpaid docs are going to leave medicine and supply will go down...SHORTAGE!